From project one, I know that things are always composed of many parts. I get to know what the items I choose are made up. 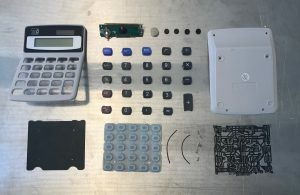 I took a calculator apart. The tools I used were screwdrivers and scissors. 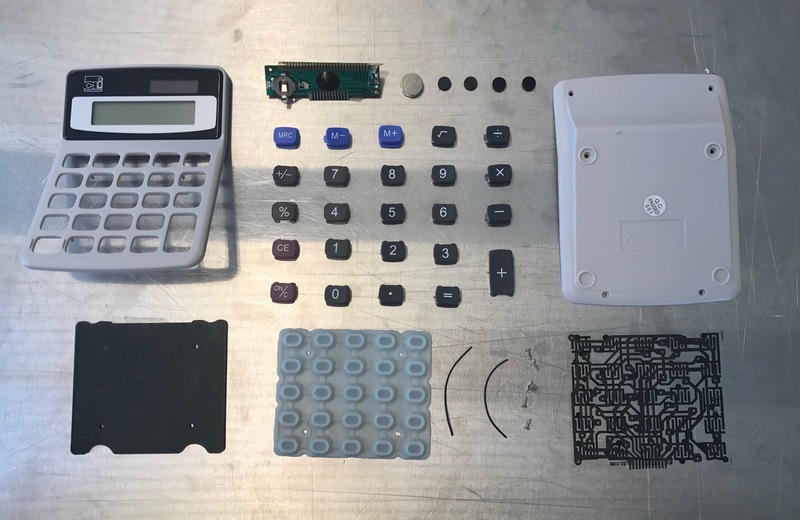 After I take apart my calculator, I put the parts into three different compositions. Those three compositions demonstrate a view of what’s really inside a calculator, and the relationship between space and objects. Each composition has a different feel. Through this project and the the discussion we did in the class, making and fixing skills are very important to people. Because we don’t get to make and fix things by ourselves nowadays. This project has influenced my ongoing creative practice by giving me We should always try to rise our manual competence. The important lessons to support the process were having imagination to create three different compositions are not easy, and taking your object apart is difficult. Through this project, I get to know more about my object I choose. The eight drawings we did are basically focus on the height, wise and length from the parts we choose. First, we used ruler to measure each of them, and put down the numbers. Then, we drawing it on the paper, most of my drawings were in scale 1:2. Then, you put down the measurements near the drawings, later you label the materials it made. From this project, we can easily learn how to draw a design drawing,and it is very important to learn this knowledge. It really helps us focus on the space composition. 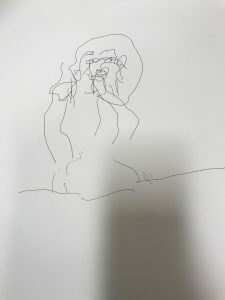 We did blind contour drawing first, all the drawings were made in one continuous line. I did seven pictures for the first part, one for my hand, three for a classmate, and three for my objects. My partner and I traded each other with three parts in the bag. We feel the edged of the objects without looking inside the sack and draw what I see with my hands. We can easily tell the way how we improved the drawing from part 1 to part 2. The drawings are getting more specific and delicate. 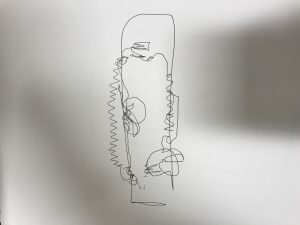 This project actually helps and teaches me how to get to know something or someone well by putting them in one continuous line. 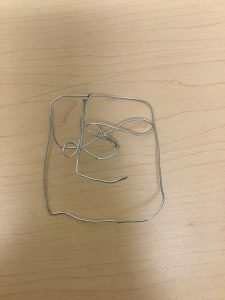 This project is very interesting, because we get play with the wire. 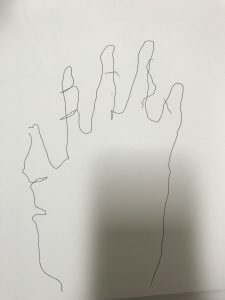 By using wire, we had to focus on the angles and shapes of the lines we did on the drawing. When I were doing the wire, I could image how I did the drawing before and the how different between the real items and the blend drawing. 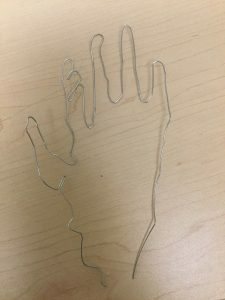 The project is super fun, that we used different tools to learn how to cut wire and make wire into different shapes and angles. This project is basically to build a structure from which to suspend my five wire drawings in a mobile formation. We are allowed one point of attachment to the Waller calling using a push pin or 3M hook. 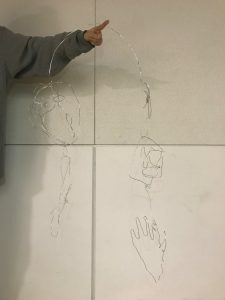 The individual wire parts engage with each other together, as in a community, it actually represents that everything could be balanced into one composition. 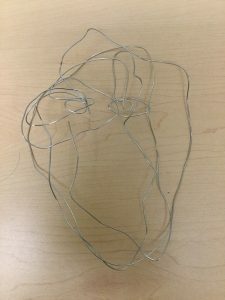 By using wire, I get to know the relationship with wire and space. The different compositions which we could make are just like the balanced world we are living now. The important lessons to support the process were having passion on what you do, and you are actually doing something wonderful to this world. How would I’ve done influence my ongoing creative practice is I get to have more ideas when I was thinking to make the projects well, and my making skill has been improved a lot. The feedback I did receive from peers in class were they all thought my projects were on the right track and the ideas I had from each project were interesting. Because I know everyone’s compositions are different, we all have a separate mind. The lines in our minds are giving us different compositions and inspirations.